Home Health creates personal care products based on traditional, natural ingredients. 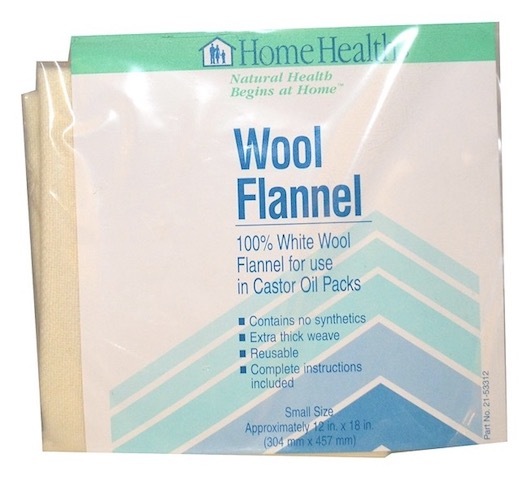 This small wool flannel is ideal for use in castor oil packs (complete instructions included). Made from heavy quality, unbleached 100% white wool flannel. Contains no synthetics. May be used up to 20 times. Small size: approximately 12 inches x 18 inches (304 mm x 457 mm). Directions: for preparation and use for Castor Oil Packs: Fold the Wool Flannel to a size large enough to cover the body area involved. Pour Castor Oil into the flannel until the flannel is saturated but not dripping. Apply saturated cloth to the desired body area. Cover the saturated flannel cloth with a piece of plastic sheeting (ordinary kitchen plastic wrap works fine). A heating pad may now be applied on top of the plastic. Begin with a medium setting on the heating pad, and then proceed to higher temperatures if comfortable for a total of 30 to 60 minutes. The skin may be cleansed afterward using a solution made from two teaspoons of baking soda dissolved in a quart of water. Store the flannel pack in a plastic bag or container in the refrigerator for future use. Upon subsequent use, you may need to add a small amount of Castor Oil to bring the pack back to saturation. Discard after approximately 20 uses or 2 months. Ingredients: 100% White Wool Flannel, Heavy Quality, Unbleached. Warning: Do not apply to broken or irritated skin or areas affected by rashes. Discontinue use and consult your doctor if skin sensitivity occurs. Avoid contact with eyes. Do not use on children or animals. FOR EXTERNAL USE ONLY. KEEP OUT OF REACH OF CHILDREN.